Are you wondering how to come up with greeting card sayings to suit your card? Whether you buy or make you own greeting card, your card features are not just for decoration. They can do a lot for you including providing inspirations for your greeting card messages. 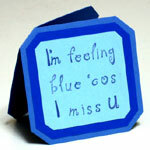 Hence, this page provides you with greeting card sentiments that suit various cards as well as occasions. By the way, you may notice the same card in various sections. It’s not an error. It simply means there are a few ways to use that card. In passing, if you’re wondering how to come up with messages like these on your own, it’s easy. Either use the accents of your creative cards to make the creative greeting card phrases or use the special attributes of your unique cards to create the unique greeting card verses. Also, if you’re interested in putting together the greeting cards, then consider the verses as portals to their respective free card making instructions. the two cuties in love? That's me and you Baby! "You guys look so cute together,"
In case you didn’t notice, this page illustrates one way to create greeting card saying. However, there are many other ways to put together greeting card messages. Besides, new greeting card verses get added on this site from time to time. So, subscribe to this site’s blog and you won’t miss them.